Previous findings have demonstrated that direct-acting antiviral (DAA) therapy leads to sustained virologic response (SVR) among patients with hepatitis C virus (HCV), a result that is considered a cure and may reduce the risk of hepatocellular carcinoma (HCC). HCC is rarely treated with antiviral therapies, and the prognostic effect of achieving SVR with DAA therapy among patients with HCV and HCC requires further study. In these case studies, the study participants with HCV were treated with DAA therapy. Both patients were found to have HCC following magnetic resonance imaging, and achieved SVR and improvements in HCC tumor burden with DAA but without any interventions for HCC. For this case series, the authors present procedure and treatment specifics for 2 patients, and discuss the potential role of DAA and immunosurveillance in this patient population. 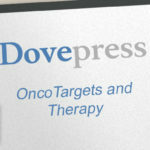 Abstract: We describe two cases of patients with hepatitis C virus (HCV) treated with direct-acting antiviral (DAA) therapy who had dramatic improvement in hepatocellular carcinoma (HCC) tumor burden with DAA therapy alone. Both patients were diagnosed with HCC on screening magnetic resonance imaging shortly after beginning DAA therapy. 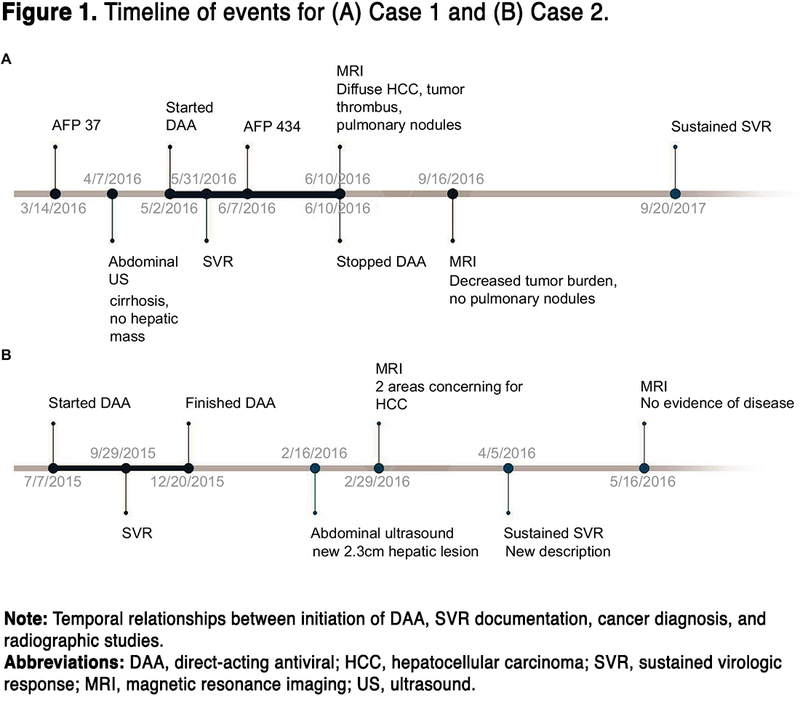 Both patients achieved sustained virologic response (SVR) with dramatic improvement in HCC tumor burden on follow-up imaging without HCC treatment. Patients with multifocal or advanced HCC are infrequently treated with antiviral therapy for HCV. As a result, these cases provide unique insight into the ongoing debate regarding the impact of SVR on existing and recurrent HCC. We review the current literature regarding this debate, as well as the theory of immunosurveillance. We postulate that DAA therapy activates CD8+ T cells to induce a T-cell-mediated response and increased immunosurveillance to virus-induced liver cancer. Hepatocellular carcinoma (HCC) is an aggressive malignancy that occurs almost exclusively in patients with underlying liver disease. In the USA, hepatitis C is the cause of almost one-third of HCC cases and the incidence of HCC continues to rise.1 Direct-acting antivirals (DAAs) have revolutionized the treatment of chronic hepatitis C virus (HCV) infection, and now a cure, as defined by undetectable HCV RNA in the blood 12 weeks after treatment ends (sustained virologic response [SVR]), can be achieved in >90% of patients. Retrospective data suggest that among HCV-infected patients, achieving SVR reduces the risk for a new HCC diagnosis. 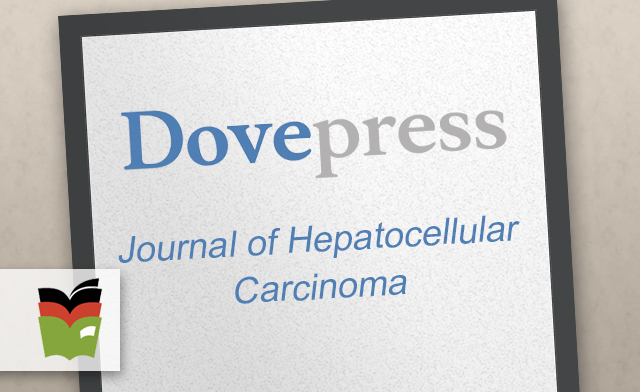 However, little is known about the effect of clearing the HCV on the prognosis of patients with pre-existing HCC and some recently published larger studies2,3,11–13suggest that DAA is not associated with a higher rate of HCC.2 Several recent publications have spurred the debate reporting that patients with HCC who are subsequently treated with DAA have a higher recurrence rate of HCC.3 We describe two HCV patients diagnosed with HCC whose tumor burden improved, not with any HCC-directed treatment, but with the achievement of SVR after DAA therapy. A 56-year-old Brazilian female was first diagnosed with genotype 1 HCV (subtyping not performed) after presenting with hematemesis. Endoscopy revealed grade 1 varices, and subsequent diagnostic work-up confirmed HCV RNA at 191,514 copies/mL. Pretreatment abdominal ultrasound showed no focal hepatic lesions. She was treated with a pangenotypic NS3/4A protease inhibitor–NS5A inhibitor combination on a clinical trial (Figure 1A). Five weeks after initiating HCV treatment, surveillance AFP levels rose from 37 to 434 ng/mL. MRI of the abdomen performed at that time demonstrated regions of early arterial enhancement with late washout involving segments IV, V, and VIII with tumor thrombus into the left portal vein (Figure 1A) as well as a separate 1.3 cm lesion with early arterial enhancement and washout in the caudate lobe, consistent with diffuse HCC. Bilateral lower lobe pulmonary nodules measuring up to 1.1 cm were also identified, highly suspicious for pulmonary metastases. As per study protocol, HCV therapy was discontinued at that time, although she was HCV RNA negative at 6 weeks of treatment. Given that she had well-compensated Child–Pugh Class A cirrhosis, a well-preserved performance status, and stage IV HCC, she was offered palliative sorafenib with plans to repeat imaging at 3 months to assess response to therapy. However, before treatment was initiated, a repeat pretreatment MRI was obtained demonstrating an interval decrease in regions of abnormal arterial enhancement and washout as well as decreased portal venous tumor thrombus and resolution of the previously seen pulmonary metastases (Figure 2B). Her repeat AFP had decreased from 434 to 7.48 ng/mL in the same time frame (12 weeks after DAA therapy was discontinued). Given the radiographic improvement in disease burden, she has been monitored off therapy for 18 months without recurrent disease on follow-up MRI examinations. SVR has been durable.